Thanks for watching my film ! If you liked it and are curious about when and how it was done, have a look here ! 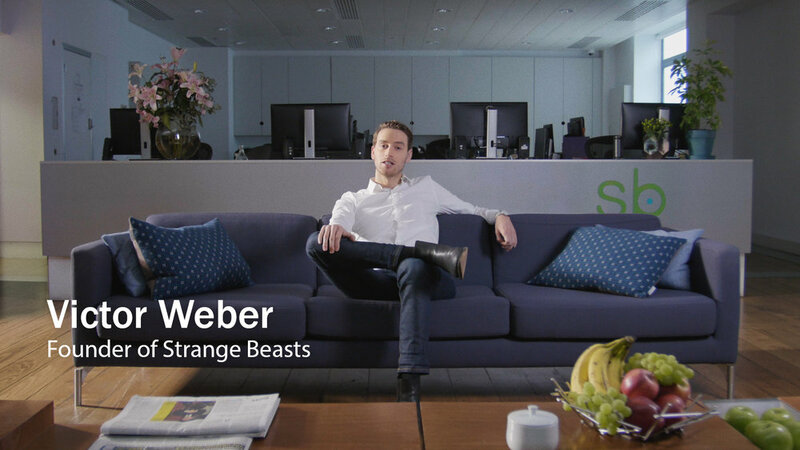 ‘Strange Beasts’ had its cast&crew & friends screening at Framestore, London (February 2017) and its official online release on ‘Short of the week’ (March 2017). 24 hours later, it's a staff pick! Yipee! It even has its own little imdb page. ‘Strange Beasts’ is a self-funded short film. Thank you so much everyone who got involved. To make a good hoax, it has to look and sound absolutely real… Or it won’t work. I had to be well informed. So I’ve watched even more videos about Virtual Reality, Augmented Reality, the latest game trends, the future of gaming, the latest gadgets in development… Very geeky time indeed. But I quickly found out, there’s a lot of those ‘demo videos’ online, which are pretty much exactly what I wanted to do... So I turned my ‘hoax’ into a narrative, which I think translates how I feel about Augmented Reality : It's a mix of fascination and a bit of fear too! It was really important to get the design right. I thought, for this short to work properly, I need people to like the designs at least! Then my friend Dean, a talented concept artist, got involved and is responsible for all the modeling, texturing and CG concepts of both creatures. Walter was way too scary at the beginning! March/April 2016: Meanwhile, I start to organize the shoot, I present my little script to a few friends, then friends of friends, etc… Until I get my team complete. It was a small on-set team (11 people, 1 person per task, literally) but a great one! I rent a bit of material and get the authorisation to shoot inside of a VFX house in Soho. I needed a ‘high-tech'-office looking place, it was perfect! 2 days shoot (Saturday-Sunday), mid-April. Above: Some members of the team, end of day 1. Standing, left to right: Bridget (makeup and hair), myself, Anthony (DOP), Michael (sound recordist). Sitting, left to right: My super mate Vince (2nd assistant and on-set photographer), Tim (actor), and Amelie (first assistant). May/June/July 2016: I put together a first edit and start all the CGI and UI, and compositing on my own. All of that on evenings and week-ends as I had a full time job. I realise I can’t do both. I quit my job. I should also mention, I could never have done this short without my friends Amelie and Pery, founders of the VFX studio 'Peanut'. They supervised theVFX on set, they are responsible for all the tracking, and for the little anecdote, they also introduced me to Tim, the actor. And then Tim introduced me to the young Poppy and her parents, whom he met on a previous shoot. August/September 2016: I get more help for ‘step 2’ of the CGI: Rigging and animation. My friend Maickel for the rigging, Joff and Phil for animation. That’s also when I meet Pierre, the sound designer and compose, based in Paris. October 2016: When the anim was close to final, I contact Rick and Mario from the studio Red Knuckles, former Art directors at Passion Pictures (that’s where I met them) and they say Yes! Awesome! They did the rendering and compositing of the creatures. Thanks again guys. Red Knuckles is co-producer of the film alongside Peanut. December 2016: Happy Christmas Holidays everyone. January/February 2017: Red Knuckles delivers the final rendered/comped sequences. Anthony (the DOP) puts me in touch with Lewis at Electric Theatre Collective, who does the final grading of the movie. I had pre-graded the film myself, as I wasn’t sure I would get a professional grading. All I can say is, it was SO worth spending the time with Lewis in the colour suit. Pierre (the composer) delivers all the files for the final mix. Yipee! Conclusion… Once, I've heard on a podcast someone said: "When you're a young artist, and truly believe in your idea, you might feel you're not carrying your project, it's the project that carries you." It all makes sense Today. I feel amazingly lucky to be surrounded by great, talented people. I am so grateful to everyone who has helped me achieving this little short. Thank you.